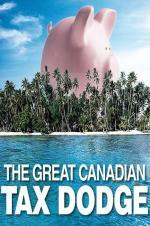 Buy or Rent The Great Canadian Tax Dodge (2015) Movie DVD & BluRay Online! Movie Plot: Canada loses $80 billion annually in tax revenue to corporations legally, and aggressively, exploiting tax loopholes. Were this money taxed, instead of flowing into offshore tax havens, the Canadian government would garner $20 billion annually. Facing deficits and lay-offs, this film explores both sides: those who believe this is good for Canada, and those who believe it endangers democracy itself.